U.S. Senate candidate Roy Moore, centre, looks at election returns with staff during an election-night watch party at the RSA activity center, Dec. 12, 2017, in Montgomery, Ala. This time, Donald Trump's playbook didn't work. 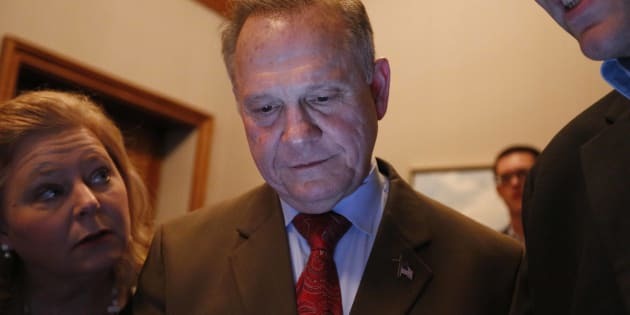 Republican Roy Moore faced serious accusations of sexual misconduct in his bid to become Alabama's next senator. But instead of bowing down and backing out, he stayed in the race and went on the attack ― just like Trump did in last year's presidential race. He accused the media and the establishment of orchestrating a conspiracy against him, and cast the race as pitting good against evil, Christians versus everyone else. But on Tuesday, Alabama sent a message that this time it wouldn't work, not even in a conservative state that Trump won by 28 percentage points in 2016. Democratic candidate for U.S. Senate Doug Jones and his wife Louise wave to supporters before speaking Dec. 12, 2017, in Birmingham, Ala. When Jeff Sessions stepped down as senator nine months ago to become Trump's attorney general, it was considered a sure bet that the seat would remain in GOP control. "On a very personal level, I want to thank each of you for fulfilling a lifelong dream to serve in the U.S Senate. Thank you all, god bless you." National Democrats tried to help out by staying quiet. Associating with the party wouldn't help Jones, who was trying to emphasize that he would work across the aisle and not be beholden to people like Senate Minority Leader Chuck Schumer (D-N.Y.) and House Minority Leader Nancy Pelosi (D-Calif.). While Republicans are no doubt unhappy to lose a Senate seat, there are also some sighs of relief. There's a solid case to be made that they'll be able to win it back during the regular election in 2020, if they have a more traditional candidate. And now, they won't have to constantly be on the defensive about being a party that harbors an accused child molester. Special elections aren't reliable predictors for what will happen during a regular election. But Jones' win gives a boost to the resistance movement that formed after Trump's victory last year, and it underscores the importance for the party of investing in all 50 states ― so that when a Moore-like opportunity comes around, Democrats are ready to take advantage of it. It also showed yes, there are some allegations too grotesque for voters to stomach, even when a candidate follows Trump's playbook.